ExpandDecider subclass which rejects terms in a specified list. 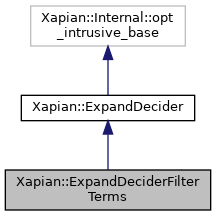 ExpandDeciderFilterTerms provides an easy way to filter out terms from a fixed list when generating an ESet. The two iterators specify a list of terms to be rejected. reject_begin Begin iterator for the list of terms to reject. It can be any input_iterator type which returns std::string or char * (e.g. TermIterator or char **). reject_end End iterator for the list of terms to reject.